Lots of people ask me what they should buy before starting a refurbishing business, and they are usually surprised when I tell them not to buy anything (aside from inventory, of course). Maybe a screwdriver kit from iFixit, because that's obvious. Maybe a desk to work on, but that shouldn't be paid for -- it should be found in an alley on trash day. Look for absolutely every excuse to NOT spend money. Your freedom as a business owner depends on having a positive bank balance. When that runs out, you're done. Think of it like a game -- the world wants to rob you, and you're not going to let it! Instead of proactively spending all your money, or even worse, going into debt, you should do a proof of concept and let the demands of the business transactions you encounter tell you what you need to buy. In a transaction-based business, it all comes down to the ingredients of the transaction. The sum of the costs involved (your cost of goods sold) should be less than what you sell it for. Sale price minus COGS equals profit. The transactions you engage in should ALWAYS produce profit. If they don't, you're doing something wrong. Yes, there may be capital expenditures that you end up having to endure in the long run, but for now let the requirements of the transactions -- laptops right in front of you that you are going to repair and sell -- tell you what you need to buy. And even then, try to find workarounds. It's all about proving to yourself that you are building a ship that floats and doesn't leak. If you buy piles of expensive equipment just because you think you'll need it, and you rent a retail space just because you think you'll need it -- because that's what everyone else is doing, after all! -- you will cloud your vision and make it very difficult to know if your ship is sinking or floating. You'll find out eventually, but by then it will be too late to change course. Don't quit your job without doing a proof of concept first. A proof of concept is a small, relatively less-risky version of the business you are planning to create. It's a test. For this test, use an inconsequential amount of money, i.e. an amount that you could lose without putting yourself in a catastrophic situation. A proof of concept could be, for example, to turn $1000 into $2000 inside of a month. My own proof of concept was to make $3000 profit within a month, and I gave myself $3000 to work with. Only then would I allow myself to quit my job. Fortunately my concept was viable and I was motivated enough to make it work, and so I quit. But if I had only made $1000 profit, or worse yet lost money, I would not have been in a catastrophic financial situation. I would have been able to examine what I did wrong -- why the transactions were not profitable, or why there weren't enough of them -- and been ready for another attempt the next month, all with my corporate paycheck still keeping me afloat. Essentially, it's a science experiment: Create a hypothesis, test it, evaluate the results, then repeat. If you have no hypothesis to start with or any means of evaluating results, you're driving blind and certain to hit a wall. 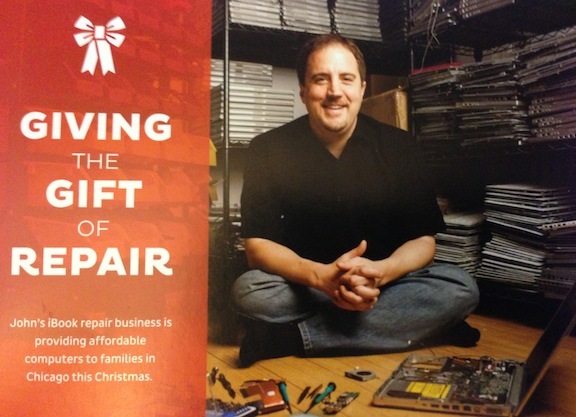 I am honored to be featured on this year's iFixit Christmas card! I have to say, it's always been great to have an ally in the repair business like iFixit, and I honestly can't imagine what repair would be like without them. Not only do they provide amazing guides that make my job easier, and allow me a forum to communicate with others on the topic of repair, but they are relentlessly dedicated to the cause of making the world a better and more repairable place. Thanks, iFixit! Also, thanks to Seth Lowe at sethlowephoto.com for taking the pictures! People interested in laptop repair often ask me for a "starter kit", which, they imagine, should be composed of all necessary repair tools, three or four easily-repairable laptops (each showcasing a specific issue), and an array of critical parts. This, they figure, should cost about $100, or maybe $200, but certainly not more, because, after all, the laptops are broken, and they are going to be doing ALL the work! And so here we have many of the myths about what I do, about laptop repair in general, and about running a business. Acquiring laptops to repair is half the battle. If I did provide a repair kit for $100, then the buyer of this kit would be the smarter one, and I would be the fool, for the kit would be an unbelievable deal. In fact, if I managed to find this repair kit on Amazon.com, I think I would buy dozens of them, and it would become my new source of parts and dead laptops. But, sadly, it's not as easy as that, and anyone selling this product would quickly go broke. Reality is that if you manage to find quality, repairable laptops cheap, it's a matter of luck, hard work, persistence, and knowing exactly what you're looking for. You can get them on CraigsList or eBay if you know what you're doing. You can get them from electronics recyclers if you work hard to establish relationships. You can drive 30 miles and meet a stranger in a parking lot to pay $250 for a dead MacBook Pro, and hopefully he will show up, not mug you, and hopefully it is a MacBook Pro, and not just a MacBook. It's a lot of plain old hard work. The repair industry is huge, dead machines are in high demand -- people think they are worth far more than they are -- and if a transaction seems remarkably easy, you probably just screwed yourself over. More important than finding laptops, it's critical to have an eye for a good deal. As someone once told me, you don't make money when you sell something; you make money when you buy it. That's because what you can sell a laptop for is perfectly clear. Simply go to eBay and do a "completed items" search, and look at the selling prices. But what you can get it for...that is up for grabs, up to what you can manage to pull off. Determining what to offer for a laptop is based on knowing what you can sell it for, understanding the defect it has and the cost of repairing that defect, and knowing how much you need to make in order for a transaction to be worth your time. In short, you need to develop your internal meter, which tells you what price to pay for your merchandise. It is the accuracy of this meter which determines, more than anything else, whether your company lives or dies. A post on a popular repair site asked how a new business should spend $1000 allocated for parts. I predict this business will go bankrupt quickly. The reason is simple: If a part is listed for sale, someone has harvested that part from a dead laptop, tested it (hopefully), listed it, and if the seller is a good businessperson, he has determined the mark-up is sufficient to compensate the required time and effort. In other words, if you buy that part, you are paying a premium. You are paying far more than you would if you were resourceful enough to do the work yourself. You're supporting a business, which is generous of you, but you're paying a premium that is unsustainable to your continued existence. Multiply the transaction times a dozen, and you've bought a dead laptop worth of parts for $1000! I'll say it till I'm blue in the face: The best source of parts is a dead laptop, and to be truly effective, you will need to become a packrat with a strategy, dissecting and inventorying hundreds of machines for the parts you need. It doesn't make for a clean living room, but it's the key to acquiring $1000 worth of parts for $75, instead of paying $75 for a single part. In order to run a business and do repair effectively, you must bang your head against the wall, over and over. Don't expect immediate success. There is no painless path, no class you can take to get all the answers, no clever way about it that is "easier". Even if you use a website like iFixit.com to flawlessly perform a repair, the ability to know what the problem is -- and to know the repair you're conducting is the right repair -- is the more critical factor, and by far the more difficult skill to acquire. I remember the first time I purchased 100 iBooks at once. I met the guy at McDonald's and paid him thousands of dollars in $100 bills. I barely knew how to replace a hard drive at the time. It turned out, 80% of these machines had the nearly-fatal "iBook G3 video issue", and it took weeks of agony to understand what I was dealing with. It was a financial loss, but I bought myself an education, and for some reason I didn't give up, even though that would have been the sane thing to do at the time. I was persistent, and I learned. The next time I was presented with 100 laptops, you can bet I knew what to check for before I handed over the money. I don't mean to discourage you, but success comes at a price, and reality has taught me to be a realist. To get your feet wet, determine what working laptops sell for by pricing them on eBay. Then find dead ones of the same model on CraigsList. Make sure to focus -- the more specialized you are, the more of an expert you will be at your specialty. Check your internal meter to determine the appropriate buying price. Subtract 20% from that figure, and send out low-ball offers. Most sellers will say no, but some will say yes. You will get ripped off, you will second-guess yourself constantly, and you may destroy a few good laptops along the way. But you will learn from every experience, and if you are persistent as you traverse this path, you will wake up six months or a year down the road with the realization that you have gained knowledge. The realization that, hey, I think I've seen this problem before, and this time I know how to fix it! 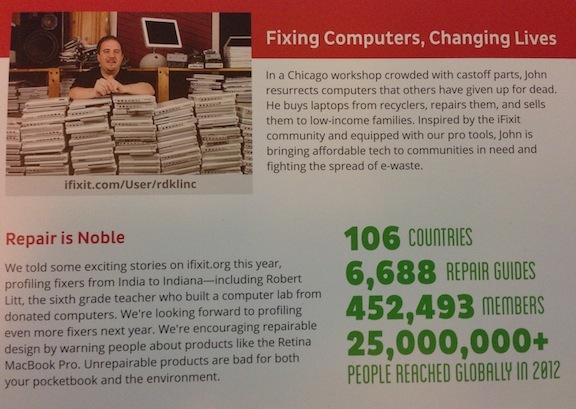 Actually, maybe I should offer a repair kit: The RDKL, Inc., Laptop Repair Kit. I'll have to charge $999 in order to cover my costs and make an adequate profit, but I think there will likely be some takers, some naive individuals willing to believe in magic. But in order to feel right about selling this kit, in order to avoid being deceptive, I think I'll have to include a disclaimer: "While this kit includes everything you need, it does not include everything you REALLY need."